Chernihiv Regional State Administration has stated there are no chemical weapons at the sixth arsenal of ammunition in Chernihiv region, where a fire broke out on Tuesday night. 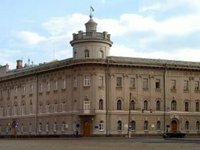 "All the services that are part of the regional operational headquarters for emergency situations have urgently gathered at Chernihiv Regional State Administration. The task is to coordinate the work on liquidation of the fire that occurred at the military warehouses in the village of Druzhba in Ichnia district, ensure the evacuation of residents from 30 settlements located in the 16-kilometer zone of the incident," the press service of the administration said. As of 08:00 on Tuesday morning some 10,500 local residents had been evacuated, including patients from Ichnia District Hospital. Some 30 bed patients have been transported to hospital in Parafiyivka. The issues of evacuation of people with limited mobility were also promptly resolved. "Now the explosions are continuing. Rescuers assured that there are no chemical weapons in the military depots. Now the level of the emergency is being defined," the administration stressed.